High school student Mai is just enjoying a fun afternoon trading ghost stories with her friends when a transfer student interrupts, expressing interest in hearing the stories as well. Her friends are taken with this handsome stranger, but Mai tells herself she's less than impressed. 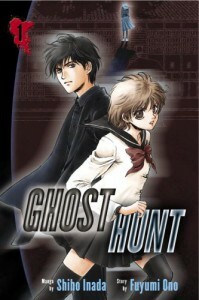 But as fate would have it, she ends up having to work as his assistant while his real assistant heals up from an accident Mai may or may not have had something to do with (inadvertently) and thus, she gets drawn into the weird world of ghost hunting at the old abandoned school building that apparently every Japanese school has on the grounds somewhere if anime is to be believed. You see, this guy - she calls him Naru - is a ghost hunter in the vein of all those TV shows with dudebros locking themselves in old buildings and shouting at dust motes, except he's less dudebro and more sort-of scientist, with all sorts of electronic equipment. But he's not the only person the school called to take care of the problems at the abandoned school building. They're a motley crew, including a monk who doesn't act very monk-like, a surprisingly old miko, a surprisingly young priest and a TV phychic. And while they're together, they have some disagreements about what's causing the unusual phenomenon at the school building, or even if there IS anything supernatural. I really enjoy how they set this first case up - we get to meet these people, see how they interact and, by dint of Mai's novice nature to all of this, we get things explained without too much of a break in the story flow. And I actually love what's happening at the old schoolhouse as well.